Howdy! We are 6 weeks past our grand opening day and still having so much fun out here I just had to share it with everyone! Typically, when you think about a beekeeping store, you probably think of HONEY first, right? That’s awesome! YESSSsss we have lots of honeys, honeycomb, raw honey, local honey, creamed honey, honey from right here in Austin. We also have honey from other Texas locations. We even have delicious honey all the way from Hawaii! Look up the benefits of honey! Local, straight from the beekeeper and the beehive. You are in for a sweet surprise. Raw honey is a great substitute for sugar in almost every recipe. Also, honey has surprising benefits for allergy sufferers who eat small amounts each day. In other words, it can strengthen the immune system and build resistance to pollen allergies. Come by our farm store and taste all the different types of honey we have on hand. Take a quick tour into the apiary (that’s another word for bee yard) and watch the honey bees in action! They are collecting nectar, pollen, and water from the local area and bringing it back to their colony. We have a few colonies with viewing windows into the hives. Watch the bees bringing resources back into the honeycomb. It’s great fun and educational for the whole family! Honey is not the only thing we have in our beekeeping store. You don’t have to be a beekeeper to shop here. We have something for everyone, including YOU! There is more ‘bee bling’ here than you have ever seen in one place. We have t-shirts, hats, jewelry, socks, baby clothes, dishes, towels, pictures, lamps, books, soaps, lotions, beeswax, candles, honey spoons, candies, cookies, energy bars, and so much more. 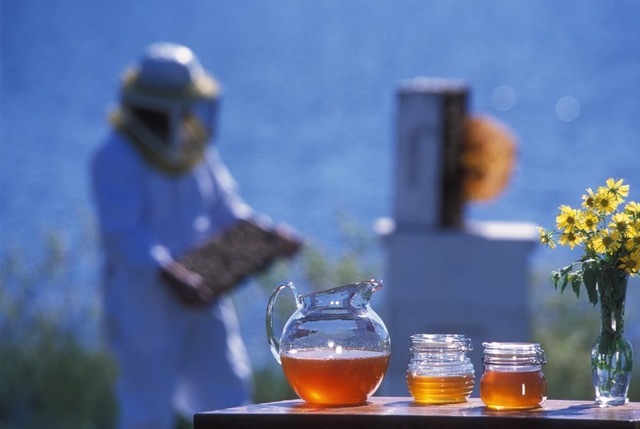 Want to become a beekeeper? We have the perfect education course to get you started. After that, you may really enjoy a hands-on training opportunity to get you up close and personal with the honey bees. Check out our schedule of classes at our education link or on our calendar for details! If you do happen to be a beekeeper, we have everything you need to keep bees in our equipment line. Brood boxes, honey supers, frames, complete hives, bee suits, veils, gloves, tools, smokers, excluders, top bar hives, and more. Everything is assembled, painted and ready to use! We also offer consulting with your beehives. For instance, we can help you set up your bee yard for AG exemptions, pollination, or just pure enjoyment. Last, but not least, we have BEES. We sell packages, nucs, and full-strength colonies. We also sell BeeWeaver Queens. You will want to PRE-ORDER the bees from our website. Don’t wait too long, we always sell out! To order bees please go to www.BeeWeaver.com or www.BeeFriendlyAustin.com. Queens can be ordered to ship, but all other bees must be picked up in person in Austin TX or in Navasota TX. When you visit the bee farm on the FIRST SATURDAY of each month, we have our special Tour, Talk, & Taste event! Featuring ongoing tours with a master beekeeper, an opportunity to ask all those beekeeping questions, special tastings, and more! This is the best day for a longer visit and we typically have several master beekeepers here to answer all your questions. We open early on First Saturdays, so come at 11:00 am. We run three 40 minutes sessions for the first 2 hours, and the focus is on you! As you can see, we have lots to see and experience here at Texas Honey Bee Farm. Honey, Beekeeping & Education for everyone! Please stop by soon and enjoy a visit with the beekeepers and the bees who bring you the best tasting honey in Central Texas! Please join us at the Grand Opening Event! 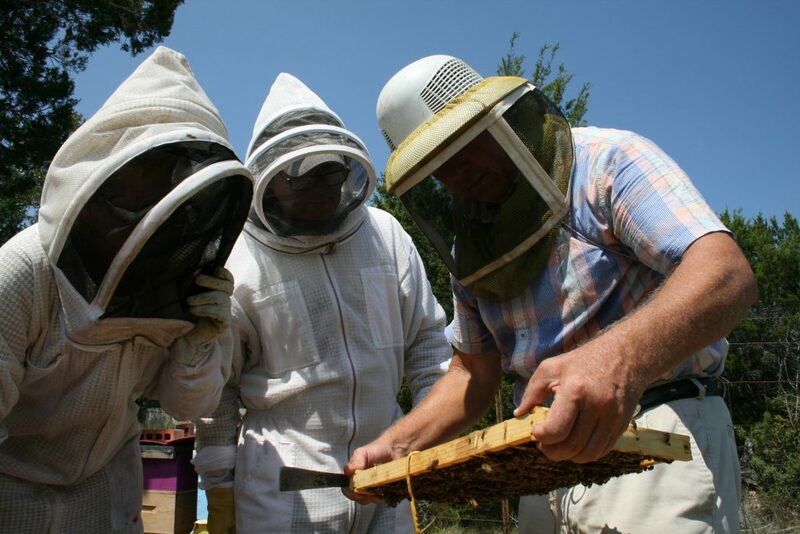 We enjoy hosting wwoofers at our bee farm! See our video here! Before we added the supers! How we set up. Each hive got 1 gallon of sugar syrup in a frame feeder. 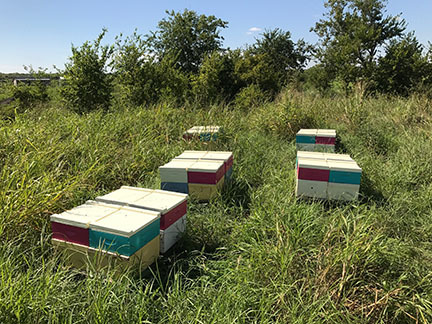 Will honey bee colonies that are progressing through fall build up, during honey flow (in Central TX), show a preference for heavily waxed plastic foundation or real beeswax foundation in their super? We have equalized the colonies, all have received their normal 2-strip dose of Hopguard II, we are feeding sugar syrup and gave each colony 1/4 of a protein patty. They are bringing in pollen and nectar already, too. We are trying to build them up STRONG and FAST! We want large strong colonies going into winter and then we hope to have bigger stronger colonies as Spring comes in 2018. We will update you here! 🙂 Ten colonies got plastic and 10 colonies got real wax. All in the same yard, all of approximately equal strength, seated on pallets of 4 hives per pallet. 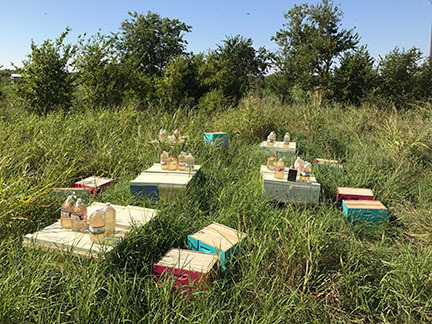 20 hives total in study. After adding the supers. Pink is plastic! Each pallet has 2 of each.